Driver Genius can detect and quickly backup drivers installed on the system. It can compress the backup drivers to a zip file, self extracting file or an independent executable auto installer program. Click the 'Backup Drivers' icon. The program searches for all drivers installed in current system. A list of installed drivers appears in the right window pane. To view details of a device driver, click the device in the list. The details are displayed in the window. These drivers are currently being used on your computer. They need to be backed up. These drivers are included in the Windows installation CD and are installed automatically during the Windows installation procedure. They normally do not need to be backed up. These drivers belong to devices which are not currently connected to your computer. If you want to use these devices in the future, their drivers must be installed on your PC. Therefore, you need to back them up. This is very important when installing drivers on a clean, newly-installed operating system. 1> Select the drivers that you want to back up and click 'Next'. By default all drivers will be backed up. This will take more time and disk space, so you may want to back up only the currently used drivers. 2> Select the Backup type. Driver Genius can back up drivers to a ZIP file, a self-extractor, or an Auto-Installer. Click the drop down menu -> Select the Backup type. Choose from the 4 options available. If you want to install drivers on multiple computers with the same configuration, we strongly recommend you should back up the drivers to an auto-installer. 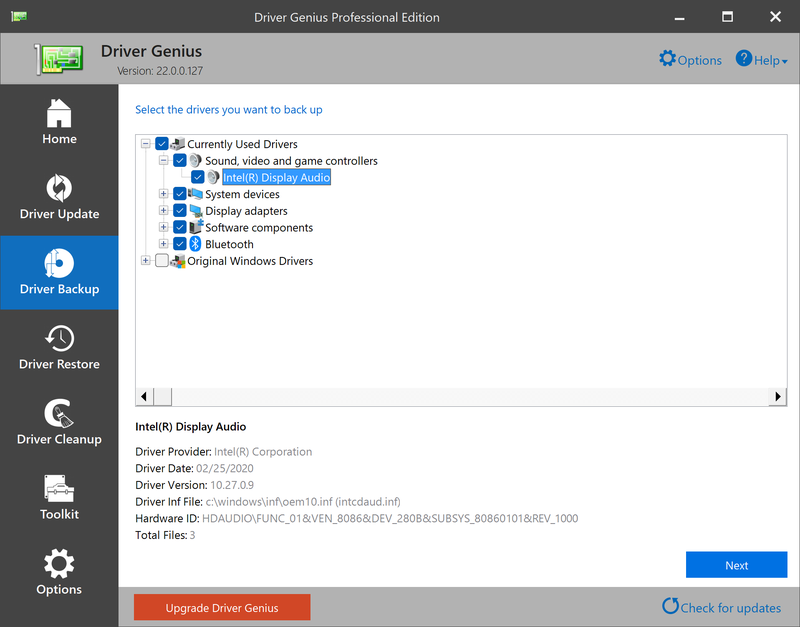 You can use the Auto-Installer to install drivers on a new system very quickly without Driver Genius, and thereby save lots of time. In addition, the trial version Driver Genius can't backup drivers to an Auto-Installer. 3> Choose a location to save your driver backup files and click 'Next' to start the backup process. Warning! Do not save the backup files in the partition where you install Windows. All data in that partition will be lost during the Windows installation process. Driver Genius allow you to backup your drivers in command line mode. /d - Default backup type, backs up selected drivers to the specified folder. /z - Backs up selected drivers and make them to a ZIP file. /e - Backs up selected drivers and make them to a self-extracting file. /i - Backs up selected drivers and make them to an Auto-Installer.